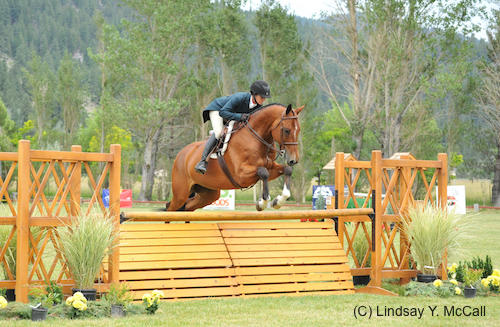 Carson City, NV - July 6, 2015 - Hope Glynn and Carson, owned by Sabrina Hellman, earned the $25,000 Franktown Meadows USHJA International Hunter Derby, by the MacLean Family, MacLean Financial Group, and Franktown Meadows. This was a long awaited win after many top finishes at the Franktown Meadows Equestrian Facility in Carson City, NV. United States Equestrian Team rider Hugh "Bert" Mutch and Dinner for Two, owned by Rebecca Reyes, captured the second place finish ahead of Buddy Brown and Finally Ours. 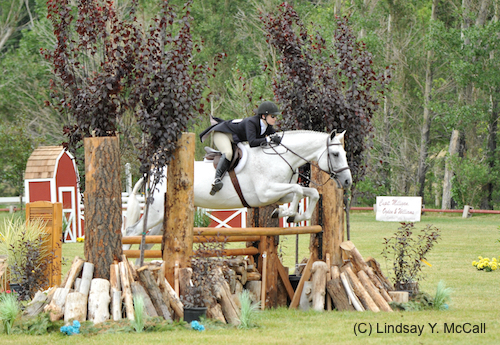 This was the sixth Franktown Meadows Hunter Derby held June 27-28, 2015. For another consecutive year the derby was sold out and spectators enjoyed the promenade of shopping, a Calcutta, a champagne brunch and a first-class experience while watching the beautiful sport of hunters. 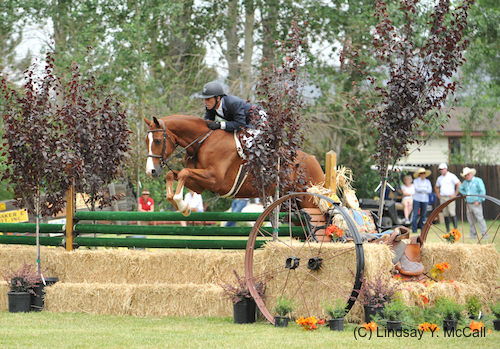 The weekend of equestrian excellence proceeds went towards the Food Bank of Northern Nevada. 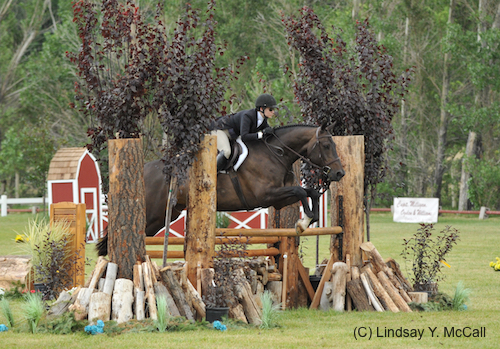 Seventeen horse and rider combinations attempted the course designed by Phil DeVita. Two panels of judges scored each round, and riders were awarded extra pointes for jumping the high options. 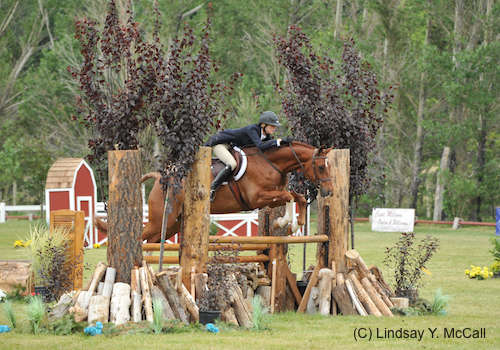 The top 12 riders moved on to the derby field for the handy round jumping many natural obstacles including a wishing well, a coupe, wine barrels, logs, and much more. The second round included 10 obstacles with four option fences. The two panels of judges were Scott Williamson, George Thornbury, John Roper, and Kathleen Rice. On Saturday Jenny Karazissis, who was the former two-time International Derby winner, won the $2,500 National Hunter Derby. 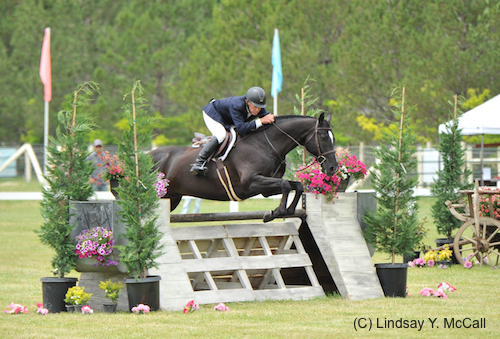 After the first round on Sunday, June 28, Jenny Karazzissis and Undeniable, owned by Noah Cyrus of Hope Town Farms, were leading the pack with a score of 185. Hugh Mutch and Dinner for Two, owned by Rebecca Reyes, were in second and Hope Glynn and Carson, owned by Sabrina Hellman were in third. The handy round consisted of ten obstacles and four options. Glynn and Carson had a forward and consistent ride and chose the tighter turns and three options. Glynn earned a 199 to take over the lead and wait for Hugh Mutch and Jenny Karazissis to take their turns. Hugh Mutch and Dinner for two completed a strong course and took each option but their score would keep them in the second place position. Former winner Undeniable stepped forward and the beginning of the course was looking great. At jump seven Karazissis was headed to the in and out and hit the rail on the oxer on the out, knocking her chances for another victory gallop and earning a eighth place finish overall. Hope Glynn's scores were superb and giving her and Carson the win. "It's the first time I only had one in the derby which is strange for me but they say you only need one to win," smiled Glynn. "My biggest concern was with the change of altitude and the length of the course. I was concerned the horses could get a little winded towards the end of the course, but he felt great. There was a high option at the end and I knew I would take it if I felt he still had enough energy. Anytime you get to come home as the winner it's always a good day for you. I wasn't a winner on Saturday, I had some mistakes, and I had some spooky horses in the National. So to be able to turn around and come out with the win in the big class was great. I think one of the real motivating factors was that every time I walked in the ring Mike Moran, the announcer, pulled out that I was third the last three years here, that gave me the push to ride a little bit better. It was a good day and I am really happy for my horse. Carson is truly a gentleman of an animal and an amazing big horse. His heart is as big as his body. It's nice for him to get recognition as a nice derby horse because he is often in the top four but he hasn't had any big wins. He truly is the best derby horse I have ever sat on and the kindest animal that I have been around; He's a true pet." Glynn has continued to ride Carson over the years and he has even taught her about her own riding. "He's an easy ride," she explained. "He is always going to go to the other side of the jump and he has plenty of step. He has a tricky left to right lead change that I need to be aware of but if I ask him to land the lead he will do it for me. In the National I ended up not in the top four because in the first round I had a late lead change. So Sunday when I walked the course I set myself up to land it and we were lucky enough to do that. He is a strong handy horse and very brave so you can slice the course and know you can take the inside options even if he doesn't see it off of the turn. He likes a forward distance more than a waiting one. I tend to be a little bit of a conservative rider, but because I know how he likes to be ridden it forces me to ride a little more off the gallop. It's how I should ride all of them." Glynn took three of the four options on the course. She noted, "My plan was that the turn was too tight on number four off the high option so that was the only low option we took just because I didn't think I could get inside smoothly and I thought I could make up for it in handy points." Glynn has supported this derby since the beginning and has been a strong advocate for the Franktown Meadows Hunter Derby weekend. She acknowledged, "I am very thankful to be able to do this derby. We have been supporters of this since the beginning. There are very few shows that exist in the U.S. that are true standalone derbies. There is this one and the one in Chicago. Events like this are for the public, for the charity, for the riders, and for the horse. There are very few shows that go into making a show a special event. Many shows are out there to make money. The horses enjoy being here, the riders enjoy being here, we all went out to dinner, all the guys went golfing, it was a really fun weekend. Whether you come out winning or losing you like being here and you want to come back. I haven't won here the last few years but I was back this year and lucky I m leaving the winner this year. I am also very lucky that every year I have been up here Sabrina Hellman has sent horses to this derby. In fact her horse Rococco won it the first year here and she was willing to send her horses up here knowing that I wasn't going to be able to be here. Sabrina Hellman is an extremely supportive owner that is a supporter of horse shows and horses everywhere. She knew this horse show was important to support from the beginning so it's nice for her to have this win and for her daughter who is an amateur and took home fifth and sixth. The whole weekend was fun." Hugh Mutch and Dinner for Two maintained a consistent ride on each round in the International, taking all four options. Mutch held the second spot through the end with his exceptional derby horse. Mutch commented, "Dinner for Two is a veteran; He is a steady eddy. He has done the international derby a few times with his owner but he hasn't done much this year. We showed extensively though Thermal and he was half circuit champion and I gave him a little warm-up in Sonoma before coming to Franktown." Over the weekend Mutch showed multiple horses. Unlike Glynn this was his first trip to Franktown Meadows. "This is an awesome venue here. I am glad we came." Mutch didn't ride Dinner for Two the prior year because his owner Rebecca was using him. Now Rebecca is focusing on Young Riders which occurs in July in Lexington, KY, so Mutch has been riding Dinner for Two at a few venues. "Dinner for Two is a great horse," said Mutch. "He jumps the bigger jumps the best and he is a horse that I can't be too handy with or it makes him a little mad. I was a little conservative when I jumped the big Riviera oxer and he landed and bucked a little. So I held his hand for a little while. I learned how Dinner for Two likes to be ridden when trying to chase down Jenny (Karazissis) in Los Angeles. I hadn't done too many derbies with him and I tried to be jumperish with him and he got mad and pinned his ears. So I learned to be more conservative and that was part of our game plan. On the course I kept going back and forth if I should jump the high oxer, but I am a gamesman and I am going to go for the high option." 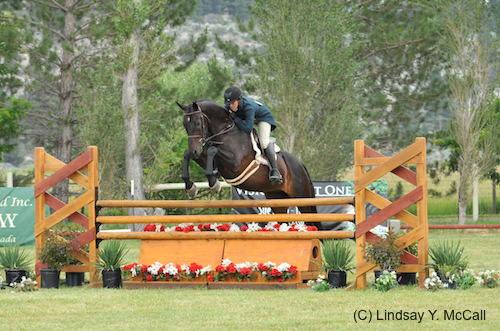 Following the Franktown Meadows Hunter Derby Mutch will head to Northern California, followed by Kentucky for Young Riders, then straight to Sonoma, and off to Menlo Park. Mutch is cheering for Rebecca, who owns Dinner For Two, as she rides for Zone 10 at the North American Junior Young Rider Championships. Participants walked away from the 2015 Franktown Meadows Hunter Derby weekend looking forward to the 2016 calendar year. 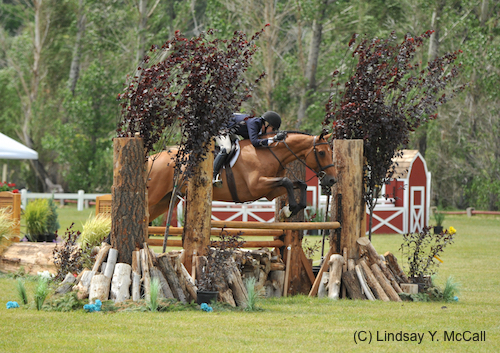 The MacLean Family is thankful to all of the riders, volunteers, trainers, spectators, vendors, and workers that made the 2015 Franktown Meadows Hunter derby a success. Almost 100 horses attended the event in 2015. For more information about the derby or about Franktown Meadows Equestrian Facility please visit: www.FMHunterDerby.com. IF YOU MISSED IT... WATCH THE DERBY LIVE!